Do you love sparkle? Then you will love this card today by Yukari. She used the big bold blooms in our new Fanciful Florals with pretty peach, mint and grey inks - aren't those colors so yummy? Then she added on those fun sparkly letters. I also love the bit of sparkle on the washi tape! 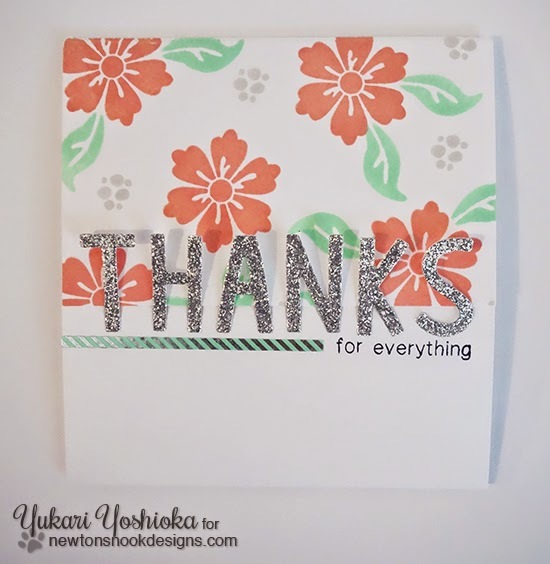 The "for everything" sentiment is from the Simply Sentimental stamp set. I also love the fun layout on this card - how she left white space on the bottom of the card. You can link over to Yukari's blog, Handmade by Yuki and see more details about her card today - Make sure you check out her other awesome work too! This is a beautiful card, Yuki! This is seriously gorgeous!! Love it Yuki!